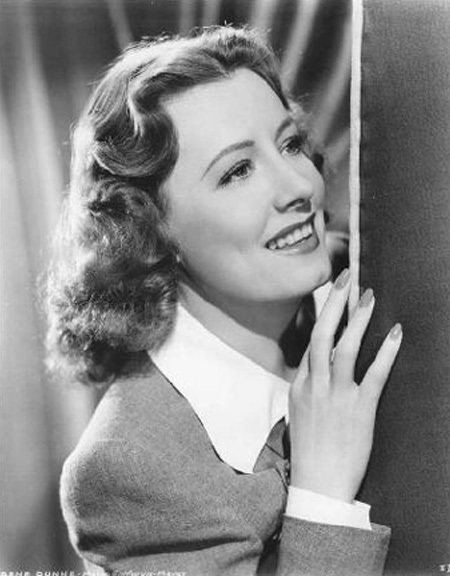 Irene Dunne was a beautiful and highly talented film actress who had an extremely successful Hollywood career during the 1930’s and 1940’s but who has been seemingly forgotten and ignored in recent years. She appeared in several fine romantic comedies and combined great focus and dramatic depth with brilliant comic timing and a natural flair for offbeat and screwball comedy. Many people would be surprised to know that during her career she was nominated for five Best Actress Academy awards. After her early ambitions to be an opera singer were thwarted Irene turned to the theater and she made her Broadway debut in 1922 in ‘The Clinging Vine’. The beautiful girl soon got noticed by Hollywood scouts and after performing in “Show Boat” on the East Coast, she was contracted to RKO Pictures in 1930. The following year she appeared in ‘Cimarron’, for which she received the first of her five Academy Award nominations. After doing some comedy routines in ‘Showboat’ in 1936 she was persuaded, albeit reluctantly, to star in a comedy movie ‘Theodora Goes Wild’, also in 1936. the movie was a big success and Irene gained her second Academy Award nomination. She gained her third in 1937 with ‘The Awful Truth’, co-starring with Cary Grant for the first time. She went on to star with him in ‘My Favorite Wife’ in 1940 and ‘Penny Serenade’ the following year. This entry was posted in 1940's, 1950's, Actresses, Uncategorized and tagged actress, cary grant, irene dunne, oscars. Bookmark the permalink.